Replacement pump for the 7.5 oz foam pump bottles. Choice of black, white or natural pump. 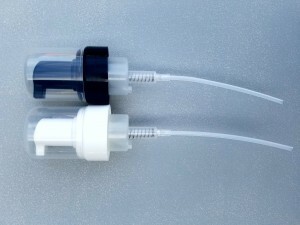 Replacement pump for the 7.5 oz (Natural) Foam Pump Bottles.. Note, the neck size is the same as for the 8.5 oz clear foamers, but the dip tube is shorter. Choice of black or white pump.